My Wii U wont work on my RCA TV! You have a monitor with in-built VGA Port and you have laptop in-built VGA Port then why you are not using simple VGA cable to both port, Please don't use any other type to Adapter. There's a buzzing sound coming from our RCA Scenium tv, how do we fix it? 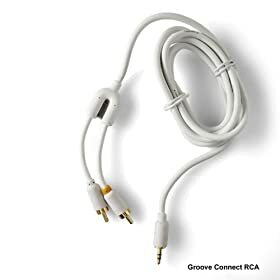 Are you using RCA type audio cables?, if so, make sure the connectors are tight and the cables are not frayed, it also helps routing those analog cables at least 8 inches away from any power cords or transformers. Buzzing usually is caused by loose ground connections or RF interference. You probably would need the extra audio cords seeings as normal svga connection won't suppost sound streaming. mixing and matching connections is always a pain to perfect. If you are using the HDMI end on your plasma, then you will have the video show up on the HDMI channel. Then get an RCA red and white pair - 3.5mm jack and plug the jack into your PC's audio connection port and the RCA's into the Audio In ports in the back of the TV. Hope this helps mate, any more q's just ask! there is a pctv button on remote. Inside door on remote rc-u38r-oc. the resolution of your set is 1024 X 768 ... so thats what you would set the video card for ..
On most handheld TV units, the A/V input requires a 3.5mm stereo baby phone plug. While on most projectors, the Video out is a composite single RCA jack. What would be needed then is a 3.5 babyphone to RCA cable/adapter. Good luck and Thank you for using FixYa. Happy New Year. You would have got a CD with this moniter..
we ahve install that cd..
VGA CORD that is blue in colour which connects your moniter with the tower. We can check the connections with the moniter for the Tower and then install the cd. can use 6917L-0085a for replacing 6917L-0085b LCD driver board? Have a manual for Samsung DVD/VHS/MP3/SVHS Playback?